3 bedrooms - 2 full bathrooms - sleeps (2-6). Luxurious Aruban Villa with beautiful Island Views. This villa has all the comforts of home! This beautiful ground floor Villa is what you are looking for. It is modern, fully air conditioned and equipped to a very high standard. It has great outdoor space with a swimming pool and comfortable accommodations for 6 people with an additional baby crib available for guests with a young child. The villa has 3 bedrooms, 2 bathrooms, an open plan kitchen/living/dining area and plenty of outdoor dining space. Guests will enjoy our lush tropical gardens, an ocean view from both the living room and the upper deck. The upper deck gives guests a magnificent view of the island, spectacular sunrise and sunset views; you will certainly unwind in comfort and luxury. The villa is equipped with Flat screen TVs in each bedroom. Cable television is connected to all TV's with the living room having a 58-inch flat screen television. The house has a built in security alarm system, wireless Internet and free calls to and from the USA! If you are looking for a totally private backyard oasis, look no further. Our beautiful property backs onto a nature reserve assuring you total privacy. It also offers relaxation with a covered patio and nighttime lighting of the surrounding pool area. There is also a lower patio area that allows for sun bathing. 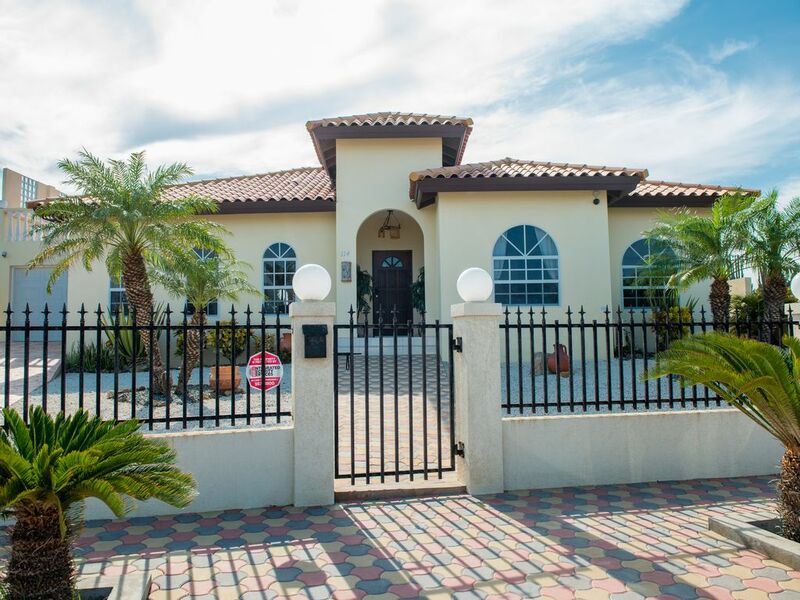 The villa is located in an upscale neighborhood only 1/2 mile inland from the beaches and high-rise hotels and minutes away from the highly rated Tierra Del Sol golf course. It is just minutes away from some of Aruba's finest attractions. Just a short 3 minute car ride to fabulous restaurants, shopping malls where you will find everything from local cuisine to TGI Friday's, an incredible choice of bars and evening entertainment, casinos and movie theaters. In Aruba, parking is not an issue just drive and park, it really is that simple! Load up your beach gear, a picnic, and take yourselves off to one of numerous coral sand beaches where the clear blue water is warm, the sand remains cool, and the views are just unbelievable. Or spend your day around the pool, with your entire home comforts close by. With a chilled drink in one hand, your biggest decision will be whether to eat in or out that evening! Our house is managed by an 'on Island Property Manager'. Our Property Manager will wait for you at the house when you arrive and she will take you through the home making you feel comfortable with the property. The Property Manager is also there to provide you with information about the Island. We offer a 10% discount for returning visitors. We also offer a 10% discount to guests that were referred to us by our past visitors. However you choose to spend your vacation, our villa provides a comfortable and luxurious base from which to explore this beautiful island. If this is your first trip to Aruba, it certainly won't be your last! help with any queries during your vacation. ~ STARTER AMENITIES include shampoo, conditioner, soap, toilet paper, paper towels and dish washing soap. There are several good supermarkets close by for the purchase of additional items. We have been coming to Aruba for over 22 years and finally decided to build a house. It is our Home Away from Home. We love it and so do our children and friends. We chose this location because it is one of the best in Aruba. Very safe, beautiful and private. The best part of this house - is it's beautiful view and total privacy. I love to sit on the patio in the morning, sipping cup of coffee and watching the sunset. In the evening, a glass of wine on the top patio complements beautiful sunset!!! Hadicurati , Palm Beech and Araschi Beech are only few minutes away. We are only 1/2 mile from the Marriott and Ritz Carlton beeches. Tierra De Sol golf course is visible from our roof patio and only 3 minutes drive from our house. You could see ocean with passing ships and kite surfers as well as the high rise hotels from our upper deck patio. Enjoy watching sunrise with a cup of coffee and sunset with a glass of wine. We provide digii cell phone to use on the island. While in the house, guest could call and receive calls from USA for free. We also have a local land phone. Each bedroom is equipped with individual airco unit. Two cars could park on the driveway. Equipped with 60 inch flat panel TV with HD cable and DVD player. Very comfortable seating for 6 with view of the ocean. Kitchen has a newly built island with granite counter-tops. Wonderful place to have meals. Sits 7. Dining room has a beautiful view of the pool. 4 panel glass sliding doors opening to the patio and the pool. We have a speaker which could be connected to your phone or other electronic devices. Balcony is located on the top of the garage, allowing view of the high rise hotels, ocean and the island. We have 2 deck areas. Both with view of the pool. Lower level with roof and one observation deck on top of the garage. Perfect for viewing sunrise and sunset. We provide 6 beech chairs, beech towels and coolers. 12 hole Tierra De Sol Golf Course is located only 2 minutes from the house. 9 hole Divi Golf Course is located 7 minutes awaw from the house. Our pool is very private with beautiful landscape. Pool is surrounded with paved deck. Our manager will wait for your arrival. My friends, my husband and I just stayed at this property and we loved the house. From the roof deck, to the pool, to the fact there was no houses directly behind us - it was all wonderful. While you do need a car to get around from this property, it was very nicely situated just off the end of the strip. Privacy, yet right around the corner from the high rises. The house was exactly as described and any issues were addressed within 24 hours. I would highly recommend this rental! We stayed at this house Dec 31 2018 - Jan 5 2019. There is no better time to be on this earth than Aruba on New Years Eve. We sat up in the crows nest of the house and literally watched the BEST fireworks I have ever seen in my life. If you can arrange to be in Aruba on New Years Eve do it. The house is perfectly located to all attractions. It is perfectly laid out. The pool is area is great for family to gather through out the entire day. We used the air conditioner a little but the ocean breeze was too wonderful to resist. The kitchen was stocked to perfection. We chose to eat out mostly but we did eat breakfast every morning at the house and ate lunch there a few days. It was ridiculously convenient. The owners were FANTASTIC to deal with. If I had any questions or concerns they addressed them immediately and efficiently. They are GREAT!! I would definitely stay here again! We had an amazing time at this home! It was truly a home. I would definitely recommend having a car. There is a grocery store right down the bottom of the hill though. I love to walk so I did walk often to the high rise area from the house. However there aren't any sidewalks until you get closer. Bruce and Gabi were wonderful to deal with. And Madeleine took great care of us once we were out there. We would definitely rent this house again! This property is well worth the cost. The photos are accurate representations and the villa is comfortably furnished. It is in a safe neighborhood and is very private. The owners, (Bruce and Gabi), have decorated and stocked the villa like a private home. They responded quickly to my questions and provided all the information necessary to get to the villa and to get in. The manager, Madeline was on time on our first and last day and was informative and very friendly. Free calls to the US was a bonus. If you are looking for a quiet place to stay but only minutes from the resorts and restaurants you can't go wrong with this property. You will need a car unless you don't plan to leave the villa. There is a grocery store and one restaurant you could walk to but the car allows you to use Super Foods for groceries and the the ability to enjoy the islands restaurants.So if you want to stay someplace quiet,more comfortable then a timeshare or resort with your own private pool rent from Bruce and Gabi- you will not regret it. The house was comfortable and beautiful. I rented this home for my bestfriend's 40th Birthday especially for the pool. She loves to swim, so the pool was a huge factor. We were pleased to see how private & safe the neighborhood was. The house was definitely our home away from our home. We loved everything about this beautiful house & relieved they supplied almost everything; from kitchen utensils, towels, beach chairs, cooler to phones to communicate to our love one. Unfortunately the instructions on how to use the phones weren't clear. Tried to communicate to the manager several times to relate a hot water issue through their phones but couldn't get through, so I went to Home Away site to communicate to owners. I also sent the owner an email (outside the site). After several days we still haven't heard from owners and now we have a few more issues we needed to address. I'm happy to say they finally responded & were very apologetic for the late response. They rectified the issue of the hot water & the pool net. I believe the owners try hard to accommodate their customers & truly mean well for each person to have a wonderful stay. It was unfortunate we had a few bumps in the road, but overall it was a wonderful stay. Had an amazing time in Aruba staying in this beautiful home! It was everything that I could have asked for and more! The property is stunning with great outdoor views and the interior is beautifully furnished and well-maintained. You can tell that lots of thought was put into the tiniest details all in an effort to make our stay more enjoyable. The property is in a great location with beaches, great restaurants, and shopping nearby. Gabi and Bruce were so friendly and easy to work with. Madeleine, the property manager, was also very welcoming and helpful. Would definitely stay here again! Our property is located behind the Marriott and Ritz Carlton Hotels that is known as the high rise hotel area in Palm Beach/Rooi Santo. We are only 2 minutes away from all beaches, shopping and attractions. Note: Until confirmed, rates are subject to change without notice. Weekend and daily rates available upon request. Major credit cards are accepted. Pricing based upon 4 person occupants. $ 30 per night per additional guest will be added Additional 3% will be added if paying by credit card. Upon receiving the rental deposit, rental lease will be sent for review and signature. Additional charge of $30 per night for Thanksgiving Week. Cleaning included. **** X-mass, New Year's Eve and Easter - Arrivals and departures on Friday, Saturday and Sunday.